seriously this is what my car needed(2009 JCW Coupe), my old blow off valve was starting to go bad... so i picked up this guy, this paired with a CAI will make sure everyone knows your running a turbo. Synopsis: Take out the guess work and get your MINI up to speed! After many years of selling the same parts over and over, it has become very clear to see which perform the best and which combination creates the most power with the most livable results. There are tons of products out there and more opinions than can be counted. Combine that with lots of misrepresentation from tuners and retailers alike and ta-da... you're confused. This Stage 1 Speed Kit is the best way to get your MINI S up to speed without dropping a ton of cash, ordering each item from different retailers, or taking the risk of buying a poorly made product. We only sell high-quality, proven products and have years of experience in the MINI world. If you're not quite ready to drop the additional cash on the Stage 2 Speed kit (which is this exact same kit but adds an aftermarket exhaust), this is the best value that will get the most gain for your Supercharged MINI. When you're ready, simply add the exhaust to your MINI for an upgrade from Stage 1 to Stage 2. Out of all the intakes on the market, there are a few that stand out. If I think they have merit, they are on the site. The DDM, Alta and JCW intakes are on the top of my list - followed closely by the AFE and KN Typhoon. I have lived with nearly all of them for at least 4 months each. 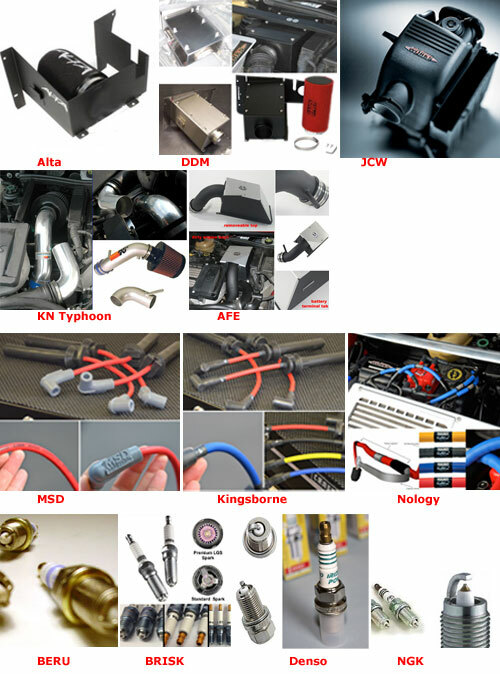 You can't go wrong with any of these intakes as they are all going to perform great and will sound similar. The Alta has a slightly higher pitch to it at full throttle but that's about it. They all produce similar HP gains. There is virtually no risk to the car when installing a cold air or standard upgraded intake on your MINI. The real power from this kit comes from the smaller supercharger pulley to replace the factory pulley. By spinning the supercharger faster, more air is pushed into the engine which in turn produces more power. We offer 15% or 17% V2 pulleys from Alta or Cravenspeed, and both are great designs. When a smaller pulley is installed in place of the stock (very lame supercharger pulley), it will bring the MINI up to speed. This will get rid of most of the lag that occurs at low to mid RPMs and wake the MINI up! The stock pulley is just a dog so doing the pulley swap makes the supercharger work a little bit more. You can feel it! Everywhere. It has proven to be safe as well. Out of the many thousands of pulleys we have sold over the years, we have only heard of one or two that have caused superchargers to go bad... which quite honestly could be contributed by a host of other issues that I hear of like belt tensioners going bad as well as plain old defective superchargers from the factory or abuse. Most professional MINI mechanics will recommend putting in a spark plug that is better suited to handle the change in performance from doing these particular mods, so we also include Beru Ultra X colder heat range spark plugs, NGK, Brisk OR the Denso Iridium IK22 plugs to keep your car performing at its best. Because no car should be without a set of upgraded spark plug wires, we also include a set of of MSD wires (red only), Nology Hotwires (blue, black, yellow or red) or Kingsborne 8mm Firebraid plug wires (red, blue, black or yellow). If your dealer refuses to work on your car because of this 'scarlet letter' in your engine bay, do yourself a favor and search "magnuson-moss warranty act" (http://en.wikipedia.org/wiki/Magnuson-Moss_Warranty_Act), print it out, give to your dealer and smile. Of course, you may need to hand them your keys so they can fix your power steering pump or your whatever that has stopped working. Plus, after your warranty has expired, it doesn't matter anyway. IMPORTANT: We don't include dyno numbers with this kit as other vendors and tuners do because it is just plain crazy to think that putting these mods on any Cooper S will generate the exact same results time and again. I have seen dyno charts from STOCK cars that pound on cars with 5K in mods as well as cars with this exact list of parts that pound on cars with 5K in mods. Every dyno is different. Every car is different. Time of day, location, position of fan in relation to the car, dyno operator, build date and what size shoes the guy at the MINI factory had on when the engine was installed all play into how dyno results are achieved. Just know that this is a great kit and you will have what I (and many other experienced MINI tuners) consider to be good products. Do yourself a favor. Consider it a doggy treat for your bulldog MINI. Get this Stage 1 Speed kit. Have it installed by a professional and enjoy. When you're ready, consider getting a free-flow exhaust system and maybe an ECU reprogrammer like the Unichip or other custom-tuned engine mapping. With those mods, you'll have a car that will easily perform as well as the JCW at a fraction of the cost. No belt is included with this kit as a stock belt can be used with the 15% pulley. If you have more than 40K miles, we suggest putting on a fresh belt and if you do a 17% pulley you will need to get a smaller belt.